The Force Awakens introduced us to the all new generation of Star Wars heroes. The former stormtrooper turned rebel, Finn, the best damn pilot in the galaxy and everyone’s best friend, Poe Dameron, and of course the Jakku scavenger and possible new Jedi Knight, Rey. While I am a huge fan of all of them (Team StormPilot), Rey is undoubtedly the one that has resonated with me the most. Inspired by Dan’s latest “Studying Skywalkers” installment on StarWars.com, I was struck by just how much Rey means to me as not only a character in the overall saga as a whole but how much she connects to me on a personal level. Throughout the film we learn more about her as she is thrust into this wholly new world. Things she never asked for or expected to happen to her. What she does is not only take these challenges head on, but she thrives at them. Being left alone on a desert planet at the age of five and having to survive on her own, Rey learned that nothing is earned without hard work and determination. In my life I have learned this lesson as well. Whether it is something from my professional career, in the realm of high school or college athletics, or just a personal goal I’ve set, putting myself to test is enormously rewarding. The way that Rey reacts to passing these challenges like piloting the Falcon to escape the First Order on Jakku, accepting that her future does not lie in her past, and ultimately answering her call to the Force, is what gives me motivation to try to be the best version of myself that I can be. 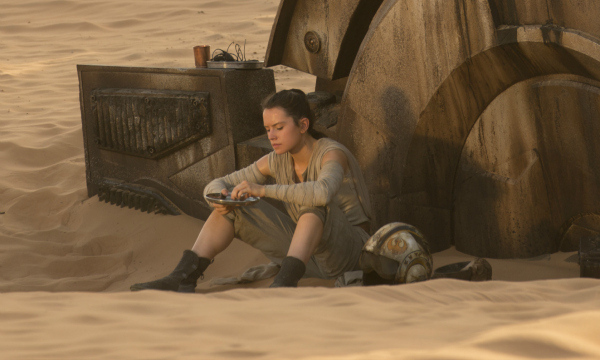 Some of Rey’s greatest strengths shine through in her comfort-ability to be alone. Through most of the beginning of the film we see her scavenging a Super Star Destroyer by herself, tending to her goods and trading them in to Unkar Plutt, and returning to her self-built home to eat her less than nourishing meal and reflect on another day of existence. While I won’t understand what it is like to quite literally have to work all day to put enough food on the table to survive, being comfortable with spending time alone is something I am very much accustomed too. Being an introvert lends itself to understanding that I can accept spending time with myself much like when we see Rey making her dinner and eating outside the AT-AT. That scene when she dons the familiar Rebel Alliance pilot helmet is one of, if not my favorite scene in the film. Besides being adorable it shows off Rey’s sense of childlike wonderment and ability to accept where she is and what she has. All key things that make Rey such an engrossing character to me. Over the course of the film, Rey is constantly struggling with what her true identity is while slowly recognizing there is much more in the galaxy than just what she’s seen on Jakku. Coincidentally this knowledge growth is also about learning of the Force. When she is led to the basement in Maz’s castle on Takodona, Luke’s lightsaber is calling to her. When she finally calls the lightsaber to her during the fight with Kylo Ren it is one of the most memorable moments in all of Star Wars. In my own life I’m experiencing this right now. As I am looking for a new job, I’m starting to realize just how much of the world is out there beyond my limited view of what I’ve been exposed to in my 25 years. In all honesty, I still have no idea at what I want to achieve in my career. It is really scary. As Rey showed in The Force Awakens, that doesn’t mean I should get down on myself or discouraged. When she finally focuses and centers herself in the Force, she is able to channel that power to overcome Kylo Ren. I still need to figure out how to channel the Force within myself and realize my true potential, just like Rey. What do you think? Any of the things I talked about here make you relate to Rey also? Comment down below or you can email in here or find me on Twitter! And as always, this is the podcast you’re looking for! Previous article Coffee With Kenobi Wins at the Star Wars Podcast Awards! Absolutely wonderful blog Mike. Rey is an inspiration to me and countless others as well. Thank you so much for sharing your take. Rey exudes self-reliance, independence, perseverance as well as a strong work ethic, loyalty and a keen mind — all wonderful qualities that she — and you — will put to good use, I have no doubt. Good luck as you travel your own life’s path. May it take you in many wonderful directions (for it isn’t always best to travel in a straight line 😉 ).